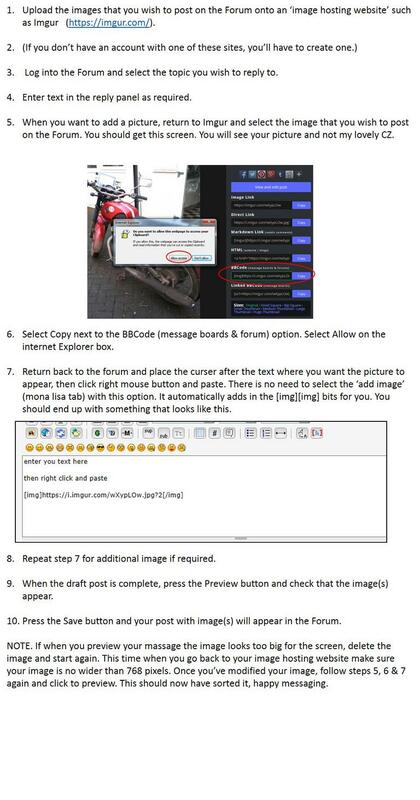 After experiencing much difficulty in attempting to load an image onto the forum, I enlisted the help of Jason Potts. The instructions below are based on Jason’s advice to me. Any errors are down to me and, if it doesn’t work, possibly you. Any improvements to the instructions are welcome. Tip: By trial and error I’ve found the maximum image width to fill the reply column is 640 pixels; any wider and the image expands beyond the column width. 2 Log into the Forum and select the topic you wish to reply to. 3 Enter text in the reply panel as required. 5 Return to the ‘image hosting site’ and choose the first image that you wish to post in the Forum and copy the http address, e.g. http://i1095.photobucket.com/albums/i468/jsmith/4%20Front%20LH%20view%20640pxW.jpg. Tip 1: If using Photobucket, place the cursor over the Direct field and left click on the mouse; the field will turn yellow, indicating that the address is now in your clip-board. There will be a similar process for other ‘image hosting sites’. Tip 2: I find Photobucket incredibly slow. To save time, if you have a number of images to post, temporarily copy and paste all the addresses into Notepad for use in step 6. 6 Paste the http address of the required image between the (img)(/img), e.g. (img)http://i1095.photobucket.com/albums/i468/jsmith/4%20Front%20LH%20view%20640pxW.jpg(/img). 7 Repeat steps 5 and 6 for the next image. 8 When the draft post is complete, press the Preview button and check that the image(s) appear. 9 Press the Save button and your post with image(s) will appear in the Forum. Just an update on Photobucket, having got my knuckles rapped. It appears the free account does not allow you to post pictures onto third party sites, e.g. the MCC forum. To post onto third party sites you will need to subscribe to Photobucket. All that's neeed to be done is.....close the bucket account, and open one with something like Flickr? 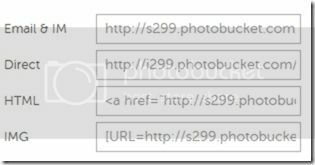 It would appear that photobucket has stopped 3rd party sharing of your pictures unless you pay now. We need to find another free image hosting website. To be honest I was sick of all the ads and irritating pop-ups on photobucket anyway. Alastair, is Flickr free?. never used that. Now using imgur. maybe we should rewrite the SOP Paul. Its an easy site to use and its free. Has anyone got the time to write up some instructions with/without images? Maybe private message it to some of the regulars on the Forum for a quality check before posting it as a new topic on the Forum. Hi Paul, I sent you and Rick a pm. Here you go, Jason’s instructions. The critical part is the link to the image. The link must be in the format shown between the ‘img’ (start) tags and the /img’ (end) tag. Groovy..... Well done That Man...….